In a hurry to make something that is tasty for breakfast, I decided to combine two ingredients in my best banana bread recipe that I have. I also used the mini-loaf pan and mini-cup cake pan to make the bite-size. As soon as the breads were baked through, each one is turned to its side to cool in the pan. If you are interested in this recipe, please let me know. So, I finally got this ice-cream machine by Cuisinart at an affordable price. It came with two freezing tubs, which is convenient. (I wished it came with lids, too.) Since my old fashion rock salt wood tub ice-cream machine was discarded few years back, I am ready to try the not so new tech. I got tired of super sweetened ice-cream from the store and all these xanthan gum or however you spell it that is being put in to make the frozen dessert sticky rather than the old fashion scratch method. And when it comes to lactose free ice cream, Raleys at my neighborhood is the only place that sale this Breyer's brand Vanilla Ice Cream Lactose Free. So, this gave me the reason to buy the machine and try my own recipe. My first home made 2010, Ice Cream is lactose free, less fat, and less sugar. Fruit flavor - Mango and Strawberries. The required freezer tubs were kept in freezer for two days to be sure that they are frozen solid. Have Bain-Marie ready (to make custard Creme Anglaise method) to heat milk & egg mixture to thicken to required consistency. Have wooden spoon and whisk, strainer, glass bowl, plastic wrap, 1 small and 1 medium sauce pans (for Bain-Marie), heat proof spatula ready. 1. Scald milk and cream in a small saucepan. Get Bain-Marie ready (large saucepan). 2. Whip the egg and sugar & Truvia in a mixing bowl till well combined. 3. Gradually add and whisk in half of the scalded milk in a stream to the egg mixture. Mix well. 4. Return all mixture into the sauce pan to mix with rest of the milk. Place the saucepan on top of the Bain-Marie. 5. Stir with wooden spoon until the custard has thickened slightly (nappe stage) - when you run your finger-tip through the back of the wooden spoon, it should leave a clear strip. Set aside to cool. 6. Prepare mango puree. Strain to remove 'fiber'. Stir the mango puree and lime or lemon juice together; then mix with the "cooled custard". 7. Cover and place in the refrigerator until completely cold. 1. Transfer the custard to the ice-cream freezer tub. 2. Process following the manufacturer's direction. Store, covered, in the freezer. Mix strawberry pieces and sugar together. Stirring from time to time until the mixture starts to thicken. Set aside to cool, then refrigerate to chill completely. Once the custard is chilled, pour theto custard into the ice-cream tub. Place the cover, power ON. Pour the strawberry pieces in. Let the machine do the work. After 40 minutes, you have another delicious homemade ice-cream. By-the-way, some recipes recommend adding red food color to give more vibrant red strawberry ice-cream. I just added more crushed strawberry than the recipe asked for. But this makes the ice-cream form 'crystal' and not so smooth due to more 'moisture' in the strawberry. This is okay with me. But you might want to try adding beet juice, for example. But I think Pinkish looking strawberry ice-cream just fine. In fact, I remember the first 'American' style ice-cream I ever tasted is made by "Foremost". The strawberry ice-cream is our family's favorite, and it is light pink with just some threads of strawberries in it. It's so easy to get hold of the potstickers / dumplings nowadays at the frozen section of the Asian market. There are only a couple of favorite brands, none that beats my mother's, of course. But nothing is better than homemade Chinese Dumplings/potstickers from scratch. From meat fillings to the potsticker skins. Most of us would refer to the "JIAO-TZE" (Chinese) or "GYOZA" (Japanese) skin as "Wonton" skin, but they are quite different - in thickness and in purpose. However, for the simplicity and modern cooking - nothing is more important than the speed and time at which the dinner is served, so the "wonton" skin would do for most. The following photo journal is to pass on the how to's-especially, to my family of making the Chinese Dumpling the traditional way. I hope it will help all visitors as well. You will appreciate it even more when you learned how much is involved in making a single dumpling skin. There are two types/methods to make the skin. One method is for dumplings that are to be boiled. The other is for pan fry method that is known as potstickers. 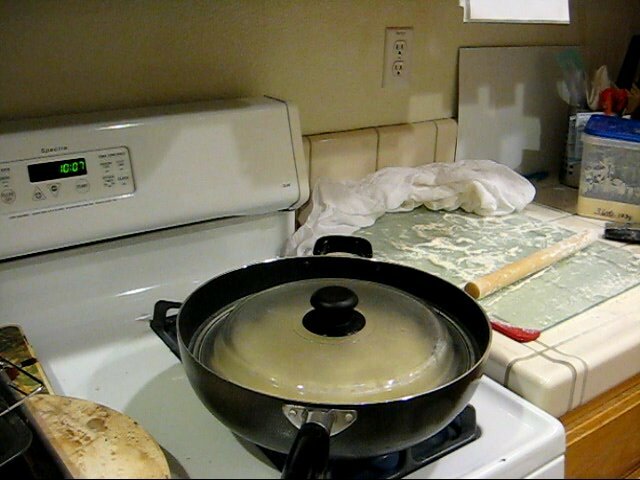 The dough for boiled dumplings should be mixed with room temperature water. 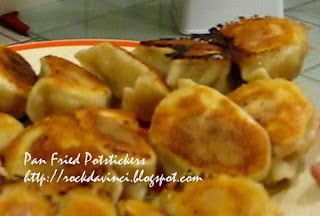 The pan fried potstickers' dough should be mixed with hot boiling water. 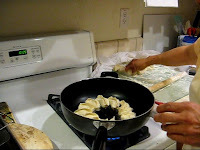 Tools: Flat bottom Fry pan with 2-inch rim and lid (preferably glass lid); Large surface cooking Spatula; chop sticks; large spoon; 2 medium bowls; straight 8 or 12 inch x 1 in rolling pin (broom stick size dowel); flat work surface; plastic wrap. In a heat proof bowl, mix flour and hot boiling water; then add water. Knead the dough just enough to form into a "smooth" ball. Cover and set aside. Chop Chinese Bok Choi with the food processor is the fastest. Otherwise, chop with knife. Extract Liquid - Place chopped bok choi in cheesecloth and squeeze the liquid out. Squeeze as much liquid as you can. I squeezed it the old-fashion-way between the palms of hands. Mix together with ground pork mixtures. Add seasonong. Mix very well. Set Aside. Cut the dough into halves. Keep the other half in the bowl and covered. Pour the 1/2 C AP flour onto work surface on a side. Roll the dough into a long rope. Cut a dough piece large enough to roll and form into a 4-inch diam circle. There should be enough to make 60 potstickers. Quickly, take a piece of dough and place on top of one palm and start squeeze and roll at the same time in a circular motion between two plams, first into a ball form, then, squash into 'disc'. Coat each piece of dough 'disc' formed into the flour that is on the work surface to keep it from sticking to others and keep it covered lightly with clean kitchen flour cloth or floured plastic wrap to keep it from drying up as well. Once the first group of dough has been formed into dough 'disc', take a piece with left fingers - thumb on the top and rest of the fingers supporting underneath slightly. Hold the dough 'disc' slightly inward toward your tummy. Imagine to pretend that you are going to play a mini-frisbee toss at your floured work surface -- that's the position of hand/fingers and dough 'disc'. Take the rolling-pin with right palm and roll into the edge of the dough and move the rolling-pin back out. Then, turn the disc slightly counterclockwise. As you turn the dough disc slightly counterclockwise, roll the rolling-pin back in. Then, move out. Turn the disc slightly again. This "roll-in" "roll-out" motion of the rolling-pin is all done by the palm of your hand that is controlling the rolling-pin. The fingers holding the dough is in synch with the rolling-pin and making approximate 1-1/2 cm turn of the disc. The rolling-pin roll-in approximately 1 cm depth onto the dough. Use your thumb as the guide. When the rolling-pin touches the thumb as you roll-in, that's good. Keep repeating the motion. Your dough disc should start to flatten out. Keep in mind also that as you turn the dough disc, try to "slightly" coat the flour on it's backside simultaneously as you turn the disc counterclockwise before the next roll-in. This is to keep the dough from sticking onto the work surface. The disc should form into a circle. The goal is 4-inch disc with center part slightly thicker than the outer part of the disc. You want the center area thick because you will be filling the skin with the meat and frying it. You want the outer area thinner because you will be clasping and enveloping the meat fillings in. Once the skin is rolled into shape. Keep it coated 'lightly' with flour, if needed, and keep it covered and set aside until all the skins have been rolled out. However, if you have a helper in the kitchen, the helper can start filling the dumpling. There are several ways to do this. You can just place the meat filling in the center of the dough and clasp the dough shut in half. 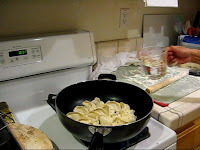 Or use Italian Pasta roller or ravioli maker and enclose the meat filling. Be creative!!! But, if you want to shape it into a traditional shape, then, here is the how to's. I am sure you will find a video clips somewhere on the internet for this. So, I am not too concerned here. But here is my version in words, then, in photos the best I can. Imagine the large "clam shell" design at the edges of an closed dumpling. I am sure you know what I am talking about. How about the Chinese Dim Sum - "Ha Gao"- the mini-size shrimp dumpling? I am sure, most of you have the experience with Chinese Dim Sum. So, here we go. Form a letter U with your left index finger and thumb. Place a piece of dumpling skin on top and hold it there. The dough disc outer edge on index finger is "top" and the side on the thumb is "bottom". Use your free hand and take 1 to 2 Tablespoonful of meat filling and place on top and center of the dumpling skin. Use your free right hand's thumb and index finger - also forming a U shape, clasp-close the top and bottom (imaginary) edges of the dough about 1 to 1-1/2 cm. Without moving your thumb, with the help of the Left index finger that is holding the dough disc (now with meat filling) move the top outer dough edge as to form a 'fold' and pass it to Right Index finger to clasp down with the bottom part of the dough. Eventually, the meat filling is now concealed in the dough disc with clam shell shaped edges. Place the completed dumpling on top of floured tray, and keep it covered until ready to cook. But, if you have a helper, and you have ... & let's say you have12 ready, then you are ready to fry them. Because of the time involved in frying, I like to wait till I have at least 24 before heating my flat bottom frying pan. Pan Frying: *1/3 C cooking oil *Have frying pan glass lid ready, 1 Cup of Hot water ready. Medium High heat - Heat the frying pan. Coat the frying pan with 2 Tb of cooking oil. Heat well. *Do not place dumpling in cold oil. *heat test: place a tiny piece of dough scrap into the oil. Is it dancing? then, it's ready. 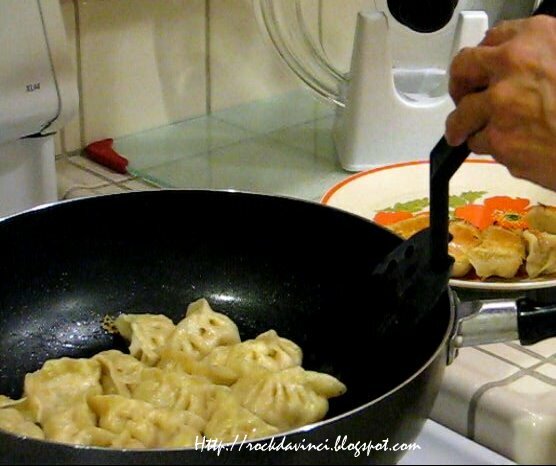 Pour the hot water into the frying pan quickly, yet gently, without disturbing the dumpling's formation. Cover right away. Cook down the liquid with lid on all the way. Do not go too far away from the kitchen. Keep your ears open to the "Pitter Patter" sound. Visually check and see the status of the liquid through the glass lid. Otherwise, Listen to the sound. It should be a gentle "pitter patter" sound being made by the "cooking oil" repelling the liquid as the liquid evaporated and reached certain level. If the liquid is still there, how much? just some liquid plus ... 1 to 2 Tablespoonful, then, that's good because those are cooking oil. As soon as you hear the "Pitter Patter" sound, turn the heat to medium. Remove the lid. Let the rest of the residual liquid to evaporate. Depending on the size of your stove's range top, shift the frying pan every so often to help brown the bottom evenly. Another sign that the dumpling is getting really done is the aroma building up... but not the burn smell. (I remember those days.) The dumpling should look translucent. So, it's time to take a sneak peek of the bottom of the dumpling. Using a spatula, without breaking the formation, lift up the dumpling gently. If it's golden brown, then, done. Carefully, using a spatula with large long surface, actually the spatula used by the grill cook for the hamburger is perfect for this. Try scoop the potstickers out all in one piece and place the bottom side up to show off the beautiful golden pan fried potstickers. If they fell out of formation... do what I do. Use a chop sticks or fork and put them back into formation on the serving plate. Serve with your favorite sauce or Mix 1 part soysauce to 2 part vinegar and sugar to taste. Add chopped garlic. - If pale - nope, it needs more frying time. - If this is your first time and the potstickers look a bit darker than the golden brown, still no problem. Try again. You still got 40 some more to practice with. *To fry the next group of potstickers, a new clean frying pan is required. Or they will become a real "potstickers" and become part of the frying pan. & don't forget to heat up the frying pan and cooking oil before placing the new batch of potstickers. You might have a difficulty in viewing mine because it is not "public", but there are many othere video clip with very good example. So, what else can I do with sourdough bread . . . eat it for lunch. With what? Oyster mushrooms. 1 package Oyster Mushrooms, washed and dried, sliced into 3rds. Heat the saute pan over medium high heat. Add butter. Allow to bring to sizzle. Add and stir fry oyster mushrooms. Cook till liquid from mushrooms evaporates and mushrooms turns slightly golden. Practice makes it perfect is what we have been taught. So, to make sure I will be prepared for the coming bread project, I made this Starbread. It's suppose to use the straight white bread dough, but I was bit tight with the resources, so I used part of my baguette doughs for it. A few weeks ago, I made this marzipan pears at home for our ARC Clulinary class' cake project. It turned out quite beautifully. I love the Almond Paste that Gabi posted at her site - http://www.thefeastwithin.com/2009/11/04/almond-paste-easy-and-homemade/. It works much better and tastier than the ones I have tried. Here is my photo journal of my Marzipan pears and how it looks like on a special occasion cake. Baking breads are lot of work, but there is a quiet period while waiting for the dough to rise. So, I got some ingredients out of the refrigerator and here it is: Stir fried eggplants with bell peppers, garlic, cilantro, chicken and shrimp, served with Gen-Ji-Mai brown rice. **MIX all seasoning above together in a bowl. Set aside. 2 Tb water + 1-1/2 tsp cornstarch mix and set aside. Stir again before use. Wash the shrimp in salt water and rinse thoroughly. Strain to dry. Set aside. Place cut eggplants on a large plate with 2 tablespoon of water. Cover with microwave oven proof cover. Microwave it for 3 minutes. Check for tenderness. It should not be cooked through (not translucent), but 1/2 way. Set aside. Heat large wok over medium high heat. 30 to 35 sec. Add 1/4 C vegetable oil. Heat until when you drop a small piece of eggplants, it sizzles. Add eggplants and cover with lid. Cook for 2 min. Open and stir. Flip each eggplant to face the opposite side down. Cover. Cook for another 2 min. Open, Add bell peppers. Stir. 1 min. Eggplants should show signs of tenderness. Return wok to medium high heat. Add 1 - 2 Tb of oil. Make sure the oil is hot - add a piece of garlic, it sizzles. Add Chicken. Stir fry. 2 min. Add Shrimp. Stir fry. 1 min. Open, Stir, Add cornstarch mixture. Stir gently to help cornstarch to thicken. Add Cilantro, but save 1 tsp and set aside. Stir. Remove from heat. Transfer to a serving plate. Top with cliantro. Prepare enough Gen-Ji-Mai as directed in its cooking instruction. Note:** wash your rice, any rice thoroughly, until the water turns clear as much as possible. Nothing is worse than eating a bowl of rice that is gunky and smelly other than the true rice. GEN-JI-MAI is really great tasting. I like it much better than the usual brown rice. Like it says, it has much better texture, and much softer. Yet, it has 64% more fiber and 400% more antioxidants... well at least that's what it claims, but I will stick with the taste bud test. Baguettes are great for breakfast or for sandwich. Home testing 1 & 2 produced dense texture; but today, it turned out just the way I would like. These test baguettes contain Starter that has been cultured for 10 days. This particular Starter do contain 15 g of fresh yeast and is meant for Sourdough Multi-grain Bread. Since I have been babysitting it for 10 days, and 360 g of it needs to be discarded, I decided to use it as pre-ferment dough called for the Baguettes. Since I don't want too much of one type of bread getting stocked up in my freezer, I made them into round sandwich bread... might have qualified as Boule, if the size is at least 8 in. But this one is brushed with olive oil and topped with poppy seed. In baking, I find baking bread the most challenging. The yeast, the kneading time, the dough texture-smooth, elastic, enough salt?, steam injection, baking temperatures, all constitutes your final Bread. Can you eat it? or use it as a paper weight. With a lots of help from some of the baker blogsites and baking pracitce, I bake twice a week at home, I think I am finally getting to know the personality of the ingredients involved. Just like Canneles de Bordeaux or any other French recipes thus far I've tested, the ingredients are very basic, but the outcome of the product is determined by the baker's knowledge and experience with the process, techniques, and heat. My breads use both home made natural Starter and or pre-ferment with dry yeast. 1. When the home made Starter (natural grape juice as agent), the Starter dough helps form a very creamy and sticky dough when mixed with the main dough ingredients. The natural Starter has enough power to ferment the dough the 1st time, very well, however, it seems to fail at the subsequent proofing. The dough would sit there motionless after hours or even after a day. until further testing, . .
2. When the home made Starter is mixed with main dough that contain yeast, the dough proofing at 2nd rise is stabilized. 3. Overall, my 325 watt Kitchen Aid Artisan mixer is no match to our classroom's commercial mixer. I finally let my mixer just knead till the true window pane - see through membrane is formed, 20 - 25 min vs 8 - 12 min. 4. Not enough salt will cause not enough browning. Not enough kneading will cause dense texture. Sourdough - Long - not enough oven spring, . . .not enough kneading . . .